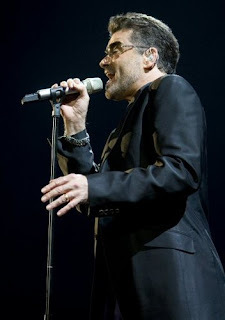 I have loved the song "Careless Whisper," by George Michael since he released it in the early 1980s. I would have been about six at the time and I can still recall the music video. Every time I hear the saxophone I get goosebumps all over my arms. Saturday night (6.21.08) one of my dreams came true--I saw George Michael perform the song live. I must admit that I actually shed a tear (I know I'm a big sap). 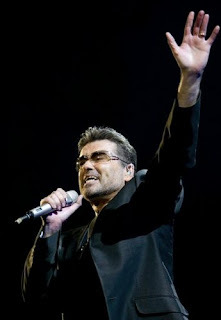 My brother Scott bought me tickets to see George Michael's concert for my birthday. (THANKS SCOTT!!!) Before the concert we went to a Brazilian restaurant at Planet Hollywood we stuff ourselves with shaved meat and then headed over to the Garden Arena at MGM Grand. Our seats we really very good (20th row on the floor, left hand side). Considering both of our heights we had no trouble seeing the stage. In fact, we had a perfect view the entire evening. It was unfortunate for the ladies sitting behind us. The concert started 45 minutes late--but I didn't care, I was just glad to be there. We saw a few famous people at the concert (Nigel Lithgow - judge on 'So You Think You Can Dance," and a player from Manchester United Futbol team). I honestly never thought I would get to see George Michael live. Last summer I purchased tickets to one of his shows in London, but with only a 2 day window to travel to England and back and flights around $1200 I just couldn't afford to go. On the last day of my trip to New York in March I saw the posters announcing his North American tour, the first one in 17 years, and I was so thrilled. After being a fan for 25 years--the concert was well worth the wait. The crowd jumped to its feet as he opened the show with "Waiting," and didn't sit back down until he rounded into some of his slower tracks ("One more try"). He seemed to place his slow songs at just the time I needed to sit for a few minutes. George looked and sounded amazing all night. 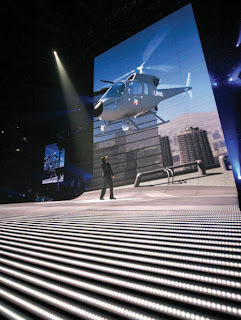 The stage design was both visually impressive and nicely unobtrusive, providing just enough effects to keep things interesting but never distracting our attention from George. 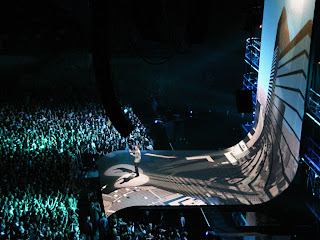 There were three video screens, including one that sloped from ceiling to the floor under Michael’s feet, and the live band was located on a three-tier set-up at the back of the stage. Throughout nearly the entire show Scott and I were cheering, clapping, waving our hands and singing at the top of our lungs. There were countless numbers of time when I looked over at him--we would smile at each other--and then keep singing as loudly as possible. I know for me half the fun was just being there with him and knowing that he was having such a spectacular time. We were surprised to see a twenty minute set break during the middle of the concert--I hadn't seen that before. I'm so extremely jealous and disappointed that I couldn't go with you. Our passion for George Michael is quite similar. You lucky duck - thanks for sharing the experience. Krista, that is just awesome! Glad you had a good time.